Post consideration of the interim report submitted by the HR Khan working group, SEBI has recently released two circulars for FPIs – one dealing with eligibility criteria for new and existing FPIs that have NRI participation and the other dealing with KYC norms for all FPIs. The Eligibility Circular delinks PMLA Rules from eligibility and prescribes rules for NRI / OCI / RI participation in and management and control of FPIs. Provides welcome clarity on grey areas raised by a previous circular issued in April. The KYC Circular prescribes PMLA Rules and additional SEBI stipulations to identify beneficial owners of FPIs. The additional SEBI rules have the potential to create confusion. The Securities and Exchange Board of India (“SEBI”) has recently issued two circulars1 (“Circulars”) with relation to foreign portfolio investors (“FPIs”) registered under the SEBI (Foreign Portfolio Investors) Regulations, 2014 (“FPI Regulations”) – one in relation to Know Your Client (“KYC”) requirements2 (“KYC Circular”) and the other in relation to eligibility conditions3 (“Eligibility Circular”). The Circulars were issued in supersession of a previous SEBI circular issued on April 10, 20184 (“April Circular”), which was the subject of significant representations made by various stakeholders for the potentially adverse impact on participation in and management and control of FPIs by Non-Resident Indians (“NRIs”), Overseas Citizens of India (“OCI”)5 and Resident Indians (“RIs”). SEBI has constituted a working group under the chairmanship of H.R. Khan (former deputy governor of the Reserve Bank of India) (“Working group”) to look into the FPI Regulations.7 Subsequent to the aforesaid representations, SEBI referred the issues arising out of the April Circular to the Working Group. The Working Group issued an interim report on September 8, 2018 (“Khan Report”). SEBI held its Board meeting on September 18, 2018, which was followed by the issuance of the Circulars. SEBI noted that PMLA Rules should be made applicable for KYC but not for restricting ownership or control of FPIs. Hence, the two separate Circulars viz. the KYC Circular and the Eligibility Circular were issued. SEBI has broadly accepted the recommendations of the Khan Report in the Eligibility Circular. The following analyses certain key features. NRI / OCI / RI participation: The Eligibility Circular provides that participation by a single NRI / OCI / RI (including those of an NRI / OCI / RI controlled investment manager) should be restricted to 25% and in aggregate to below 50%. SEBI has clarified that the above limits will not apply to FPIs investing only in mutual funds in India. Further, The Eligibility Circular also allows participation by RIs, through the Liberalised Remittance Scheme approved by the RBI, in FPIs that are global funds that have an India exposure of less than 50%. By stipulating the above limits for NRI / OCI / RI participation as described above, SEBI has acknowledged the role played by such participants in foreign exchange inflows into India. The Khan Report, pursuant to representations from the industry that all NRI / OCI / RI money not be painted with a broad brush as being proceeds from money laundering, had recommended the delinking of the application of the PMLA Rules from eligibility conditions and recommended the aforesaid limits. SEBI has admirably followed through on the Khan Report’s recommendation in this aspect. This represents a significant roll back of the April Circular and must be highly appreciated. Moreover, it appears that SEBI has recognized the global industry practice of GP sponsor commitment and the commercial imperative for such participation by NRI / OCI / RI controlled investment managers by explicitly including such participation in the limits prescribed. Also, by permitting RI investments into global funds with less than 50% India allocation, SEBI seems to be encouraging Indian residents to manage global pools of capital as well as participation in global funds. NRI / OCI / RI management and control of FPIs: The Eligibility Circular stipulates that NRI / OCI / RI should not be in control of FPIs (except for FPIs for which no-objection certificate has been provided by SEBI). However, FPIs can be controlled by investment managers (“IMs”) which are owned and controlled by NRIs / OCIs/ RIs if (i) the IM is appropriately regulated in its home jurisdiction and registers itself with SEBI as a non-investing FPI; or (ii) the IM is incorporated or set up in India and appropriately registered with SEBI. Further, SEBI has clarified that a non-investing FPI may be owned and / or controlled by a NRI / OCI / RI. This is an important relaxation provided by SEBI and a recognition of the role played by NRI / OCI / RI managers as catalysts of global capital. Timelines: FPIs have been given 2 years from the date of the amended regulations (FPI Regulations are expected to be amended in line with the Eligibility Circular) or from the date of their registration, whichever is later. In case of a temporary breach, a period of 90 days is prescribed for returning to compliance. While the period of 2 years for compliance is welcome, a period of 180 days for correction of temporary breaches (in line with that for breach of broad-based criteria) could have been considered by SEBI. The KYC Circular seeks to clarify the rules for determining beneficial owners and other disclosures required to be made by FPIs going forward. BO identification and disclosure: The KYC Circular stipulates that BOs should be identified as per Rule 9 of the PMLA Rules. BOs are natural persons who ultimately own or control an FPI. Based on the PMLA Rules standard, FPIs are required to maintain a list of BOs as per a format prescribed under Annexure A of the KYC Circular (“Annexure A List”). In a key addition to the requirements under the previous regime as well as the look-through principle enshrined under the PMLA Rules, the KYC Circular mandates the disclosure of intermediate shareholders / owner entities with holdings equal to and above the materiality thresholds in the FPI8. For such entities, the names of entities, percentage of holding, method of exercising control etc. are required to be disclosed in a format prescribed under Annexure B of the KYC Circular (“Annexure B List”). An exception to such identification and disclosure has been provided for entities eligible to register as Category I FPIs9. While SEBI has taken the cue from the Khan Report in prescribing the Annexure B List requirements relating to BO identification for intermediate entities and provided an illustration, the prescriptions (including the illustration) have the potential to create confusion among industry participants. This is explained below using the illustration provided by SEBI. In the above diagram (depicting SEBI’s illustration), FPI ABC is the FPI for which BOs are to be declared. FPI ABC is a trust held 75% by XYZ Limited, a company. 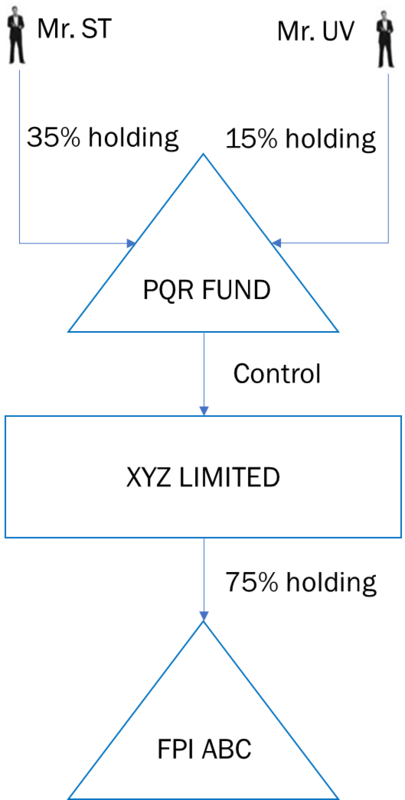 Since such holding exceeds the 15% materiality threshold for trusts, XYZ Limited should be disclosed as an owner entity. Since XYZ Limited is an owner entity which is a company, its BOs need to be identified based on economic participation (also referred to as “controlling ownership interest” for a company) or on “control” basis. In SEBI’s example, XYZ Limited is said to be controlled by PQR Fund, which is a trust. Thereafter, no reference is made to the shareholders of (and thus to economic participation) XYZ Limited. After identifying PQR Fund as controlling XYZ Limited, SEBI’s analysis switches back to economic participation with Mr. ST being described as holding 35% in PQR and Mr. UV as holding 15% in PQR Fund. Thereafter, SEBI’s analysis concludes, presumably based on an ascription of 100% holding to “control” based BOs, that Mr. ST holds 26.25% (35/100 * 100 * 75/100) and Mr. UV holds 11.25% (15/100 * 100 * 75/100) in FPI ABC. Hence, SEBI lists Mr. ST as a BO of FPI ABC and does not list Mr. UV as a BO of FPI ABC. While Mr. ST may potentially have no economic participation in FPI ABC (since his linkage is explained in the KYC Circular through a step of “control” ascribed to PQR Fund and not on the basis of economic participation) and potentially limited control over FPI ABC with the requirement of coordinating with other persons to effect definite action for FPI ABC (since it is possible that FPI ABC has an investment manager which controls its investment program), he is still recognized as a BO under SEBI’s test. Such an anomaly is introduced by the dilution of an absolute look-through for application of both ‘economic participation’ and ‘control’ tests, as contemplated under PMLA Rules. SEBI’s illustration switches between different tests of economic participation and control and creates potential confusion in BO identification. It would have been preferable for SEBI to provide further clarity, especially since it is prescribing requirements beyond the familiar tests provided under the PMLA Rules. A further area on which SEBI’s guidance would have been welcome is on the identification of “high risk jurisdictions” for which the lower materiality threshold of 10% applies. The KYC Circular has referred to SEBI’s master circular dated July 4, 201810 as determining the identification of such jurisdictions. The aforesaid master circular contains subjective / indicative criteria for the identification of “high risk jurisdictions” and also permits intermediaries conducting KYC (such as designated depository participants who carry the responsibility of registering FPIs) to independently access and consider other publicly available information while determining “high risk jurisdictions”. Considering that the intermediaries conducting KYC are private parties and not regulatory bodies, there is a possibility that different intermediaries will evolve different standards, and possibly different lists of “high risk jurisdictions”. To avoid such a situation, the Khan Report had recommended that SEBI consult the Government of India to evolve more objective criteria for the “high risk jurisdictions”. It would have been preferable if SEBI had followed such recommendation. Listed company exemption: SEBI has stipulated that foreign companies should not be allowed to benefit from the exemption under Rule 9(3)(f) of the PMLA Rules, which prescribe that it is not necessary to identify and verify BOs of listed companies or subsidiaries of listed companies. Such a prohibition goes beyond the Khan Report recommendation, which had recommended that a company from a country whose securities market regulator is a signatory to the International Organization of Securities Commission’s Multilateral Memorandum of Understanding or a signatory to a bilateral MoU with SEBI, or a country not identified as deficient by the Financial Action Task Force, should be permitted to avail of such exemption. Such a restriction by SEBI goes against the principles of comity and can make access to Indian capital markets by companies (including listed funds) listed in mature jurisdictions (including those following high standards of governance) challenging. Timelines: FPIs have been given 6 months to comply with the KYC Circular. In case of not meeting the requirements within the said timelines, FPIs shall not be allowed to invest further upon the expiry of the timeline until the KYC requirements are complied with. However, FPIs may disinvest holdings within a period of 180 days following the expiry of the timeline. Upon the expiry of such 180-day period, FPI registration will no longer be valid. The timeline stipulations should be carefully considered by FPIs investing in illiquid securities, such as non-convertible debentures and securitization receipts issued by asset reconstruction companies. It is heartening to see SEBI taking note of industry representations and the Khan Report’s recommendations in evolving rules for KYC and eligibility norms for FPIs. On a principled level, it is heartening that SEBI has delinked the application of the PMLA Rules from eligibility requirements, therefore removing the pall of suspicion cast upon NRIs / OCIs / RIs by the April Circular. There remain creases to be ironed out with respect to the KYC Circular. Further clarity on the disclosure of intermediate entities and on recognition of foreign listed companies may assist in making the KYC norms more practical and easier to comply with. The Eligibility Circular contains more positive news for FPIs. In addition to the delinking from the PMLA Rules, the Eligibility Circular has largely clarified many doubts that arose pursuant to the April Circular regarding NRI / OCI / RI participation in and management and control of global funds. To such extent, the regulatory clarity provided is welcome. NRIs / OCIs / RIs continue to remain active participants in the India growth story, with NRI / OCI / RI managers often playing the role of catalysts in attracting foreign capital to Indian shores. Most (if not all) NRI / OCI / RI managers are open to employing the highest standards of governance and assisting the regulators worldwide in meeting their objectives of countering money laundering. The Circulars appear to tacitly recognize this by splitting KYC concerns from eligibility requirements and hopefully represent the commencement of a healthier dialogue between the regulator and the regulated. 5 Under the Foreign Exchange Management (Transfer or Issue of Security by a Person Resident Outside India) Regulations, 2017, NRI is defined as “an individual resident outside India who is citizen of India” and OCI is defined as an individual resident outside India who is registered as an Overseas Citizen of India Cardholder under Section 7(A) of the Citizenship Act, 1955. 6 https://www.business-standard.com/article/markets/fpis-ring-alarm-bells-on-sebi-ownership-notice-75-bn-assets-could-be-hit-118090300903_1.html (last accessed on September 24, 2018). 7 https://www.livemint.com/Money/JLX9jKVcuzJnjkw9UrcOyM/Sebi-says-will-review-new-regulations-for-foreign-portfolio.html (last accessed on September 24, 2018). 8 25% for companies in non-high-risk jurisdictions, 15% for partnerships and trusts in non-high risk jurisdictions and 10% for FPIs coming out of high risk jurisdictions. 9 “Category I foreign portfolio investor" status is usually available to government and government related investors such as central banks, governmental agencies, sovereign wealth funds and international or multilateral organizations or agencies.